Some individuals who want to buy a house cannot afford to do so by themselves so they apply for a joint mortgage with either a partner, a friend or a business partner. This allows them to get a mortgage and in some instances get a larger mortgage than they would have been allowed had they applied on their own. Here we look at the pros and cons of applying for a joint mortgage. A joint mortgage is a mortgage that is in the names of more than one person. For example if you are living with someone and both parties want to share the responsibility of having a mortgage then the both of you can apply for the mortgage to appear in both names. This not only helps with credit scoring but also reduces the risk to both parties. Can Anyone Apply for a Joint Mortgage? Yes anyone over the age of eighteen in full time employment can apply for a joint mortgage. It is important to remember that at some time both parties will be required by law to attend a meeting with their solicitor or financial advisor in order to sign various contracts and paperwork. This is also used as a means of providing the mortgage lender with proof of identification. 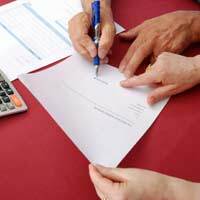 Are There Limitations to Applying for a Joint Mortgage? As with any application for credit or a loan of considerable size it is important that the lender is fully aware of what they are taking on. To this end both parties must not have been declared bankrupt and must not have been involved in any dealings with mortgages which have previously been defaulted against. The mortgage lender will first of all check you and your partner’s credit histories to make sure they are not leaving themselves open to bad debt or possible bankruptcy. How Much Can Those Involved in a Joint Mortgage Borrow? Again this depends entirely on the mortgage lender and your financial advisor or solicitor should be able to help you with this before any firm commitments are made. Normally the mortgage lender will ask you for a deposit – usually around ten per cent – and they will then lend you the rest of the money needed to buy the property. However in extreme instances a mortgage lender can lend you one hundred per cent but you should be aware that this is an extreme case scenario and normally carries with it high interest rates (normally variable) which can push payments up in value as the interest rates rise. Again your financial advisor or solicitor should be able to help you in this instance. What Happens if My Partner Leaves Me or They Die? These are obviously two events that no one wants to consider but unfortunately it does happen. To this end there will be a clause within the mortgage – or an agreement can be drawn up with your solicitor’s help – that will put procedures in place just in case the partnership dissolves. Likewise if your partner dies you will have insurance – or an endowment mortgage – which means that the cost of your partner’s share of the mortgage is covered. In some instances an endowment mortgage is paid off in the event of a mortgage payer’s death. My Partner and I want a Joint Mortgage, What Should we do first? Initially you should consult with a financial advisor or solicitor as to how best to proceed. They will help you investigate all the options and help you decide upon which product is best for you. Once you have made this decision – and know which property you are interested in buying – then they can communicate with a series of mortgage lenders in order to find the best deal for you. If you are using a financial advisor it is important to aim for one who is independent; an independent financial advisor will be able to petition a great many mortgage lenders in order to find the right deal for you whereas financial advisors who are not classed as independent simply work with a select few mortgage lenders. However you wish to proceed it is worth spending time discussing with your partner the options and coming to an agreement that both of you are happy with before entering into any financial and binding legal agreements. I bought a council flat in 2003 in borough of Enfield. At the moment I'm not sure I can sell as Enfield are suggesting changes for the estate which my flat is on and also as my flat is located near the new Tottenham Football stadium value is beginning to increase my property. However, my flat is a one bedroomed flat and there are three of us my husband and my daughter (who currently lives with her grandparents). My question is can my husband who works for British rail apply as a key worker for a mortgage as a first time buyer? Our property is in my name only as I was living in the property on my own as a council tenant before taking out a mortgage.